Steve Wingfield serves as Evangelist and President of Wingfield Ministries, an organization dedicated to assisting the local church in reaching the world for Jesus Christ. 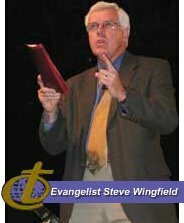 Steve has conducted major inter-denominational evangelistic meetings across the United States and overseas for over 17 years since founding Wingfield Ministries. Through local Encounters, thousands have been led to a personal relationship with Jesus Christ. Steve frequently speaks at retreats, universities and special events, and has trained thousands of believers to share their faith. At Tyndale Theological Seminary of Amsterdam, Netherlands, he teaches Introduction to Evangelism and is a frequent guest speaker at the Billy Graham Center in Wheaton, Illinois. Steve pastored a church in Roanoke, Virginia, for seven years before becoming a full-time evangelist. He is a graduate of Trinity Evangelical Divinity School and Eastern Mennonite College. He resides with his wife Barbara in Mt. Crawford, Virginia. They have two children, Michelle and David. Sam and his wife Pam make their home in Ohio and have ministered through music as a team since 1973 when they were married. They are graduates of Mount Vernon Nazarene College and have served as Ministers of Music in the Wesleyan Church and Church of the Nazarene. Sam and Pam have three daughters - Christy, Alissa, and Carabeth. Sam is one of two Choir and Music Directors for Wingfield Ministries. Wingfield Ministries is extremely pleased to be able to count Ruth Graham McIntyre as a member of our team. Ruth is an experienced and highly sought after conference speaker. She brings a new and Biblical perspective to all who hear her speak about her journey of faith. Ruth will be a featured speaker at Encounters and at special luncheons during the Encounter week. Ruth talks honestly about her personal life as she communicates her faith in a warm and winning manner. Ruth has already made many friends in Canton and Coshocton, Ohio and Plattsburgh, New York when we visited those towns for the ministry in 2000 and 2001. Buddy was born on a cattle farm in Southwest Virginia. He graduated from the Virginia State Police Academy in 1978 and spent 14 years with the Virginia State Police. In 1997, Buddy competed in the National Law Enforcement Olympics, where he was awarded the title "National Champion" in Weightlifting, and was the Silver medal winner in Track & Field in the 200 meter and 400 meter runs. He is currently the Chief of Police for Dayton, Virginia. His testimony is one of the highlights during an Encounter. Jack Richardson serves as an Encounter Director. Jack holds a Bachelor of Arts from George Washington University and a Master of Arts from Grace Theological Seminary. After a 26-year career in federal government service, he was called into Christian service as a Christian school administrator, serving in that capacity for 11 years prior to joining the ministry team. Jack and his wife Sharon live in Bridgewater, Virginia. They have three grown children and three grandchildren. Carla was born and raised in Kingsport, Tennessee. Carla attributes her upbringing at the First Presbyterian Church and her opportunities to attend church with her Grandmother and friends as having played a key role in preparing her to minister effectively to all of God's children. Carla has recorded six albums and sings for numerous organizations including the Billy Graham Evangelistic Association. Carla is guest vocalist for Wingfield Ministries. In 1990, John began Common Ground Ministries, a ministry of sharing the Gospel through song in churches, prisons, jails, retreats, revivals, community functions and concerts. He and his wife, Lydia, spent seven years in youth ministry in Costa Rica with Latin American Mission and Youth Life International. He serves as Prison Evangelist and guest musician for Wingfield Ministries. John and his family live in Berlin, Ohio.